In this tutorial, you’ll learn how to connect to your pre-installed OpenVPN service in your Seedbox in order to hide your local IP address and increase privacy while browsing the internet. For the scope of this guide, we are assuming that you know what an OpenVPN (VPN) is, if you are not sure about it and require more information please check our FAQ. Enable TUN/TAP in your Seedbox via the Seedbox/VPS Control Panel as shown in the image below. 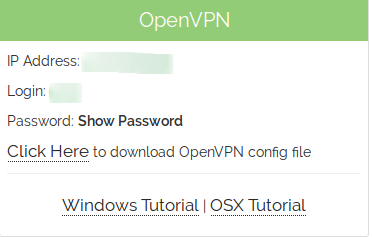 Download your .ovpn file by logging in from our web-site. You will access your Members area that has all information’s related to your account. 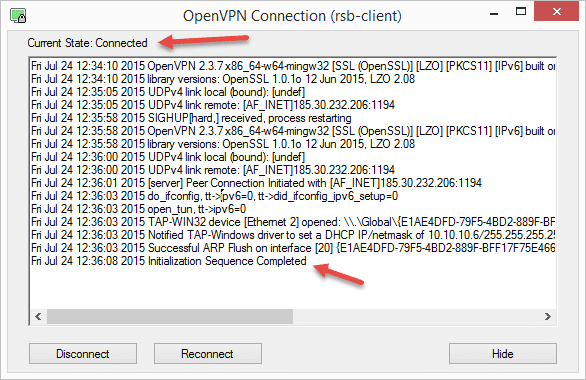 Find the OpenVPN thumbnail, and click on the link to download the configuration file. Extract the .zip file and open it with a text editor (any text editor will work). Replace SEEDBOX_IP_GOES_HERE next to remote with your Seedbox IP that was provided on “My Services” page in your client area, and save the configuration file. Open the .ovpn configuration file configuration using Tunnelblick. 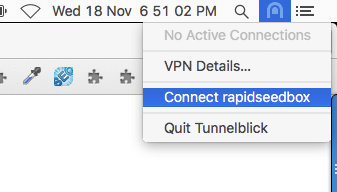 Connect to rapidseedbox OpenVPN. Shortly after you will be asked to submit your username and password. Please submit your OpenVPN credentials as provided on “My Services” page in your client area. OpenVPN Client will now initiate the connection sequence and once completed you will be connected to your OpenVPN via the Seedbox. To verify the successful connection, your client will have a “Connected” status and its icon might be colored in green. You are now browsing in a private VPN connection, congratulations! What doest does it mean? It means that you are now being identified to the world wide web (internet) with your Seedbox/VPN IP, and all your traffic goes through your Seedbox’s VPN service. Using a Whois service (like IPChicken) you will show your Seedbox/VPN IP as a proof that your browsing experience is now private. First of all, for solving this problem you must be positive that when you are connected to the VPN, you use only the DNS server/s that your VPN service is providing. From OpenVPN version 2.3.9 you can solve the DNS leaks problem by specifying a new OpenVPN option. Therefore open the .conf (or .ovpn) file that you use to connect to the server, and add the following on a new line.